That’s a shame, really…. Celeriac is a wonderful vegetable and works great with other root vegetables in soups and stews. 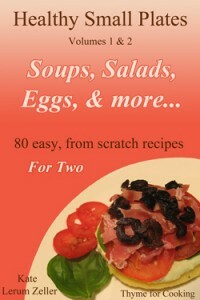 It’s also a traditional French salad, julienned and mixed with remoulade. You can cook it and mash it along with potatoes for a more interesting holiday side dish or slice it thinly and make a Potato Celeriac Gratin. There are only two serious drawbacks to celeriac: it’s knobby and ugly (deal with it!) and it turns gray when peeled, like potatoes. Well, and it’s usually big…. Too big for use in one meal for those of us cooking for two. I cut off what I want and wrap the remainder tightly in cling film. I may have to trim a bit the next night if it turns gray…. I peel the section I’m using, and keep it in a bowl of water until needed. Add the pepper, onion, celery, and sauté for 5 minutes. Add spices, garlic, mushrooms and sauté another 5 minutes. Add tomatoes, their juices, chicken stock, tomato paste and stir to combine. 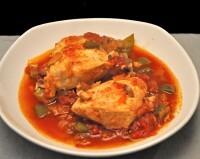 Cover, reduce heat and let simmer 10 minutes, until chicken is done. Uncover and cook a few minutes longer to thicken pan sauce. Serve with rice, quinoa or buttered potatoes. This is a Garlic Keeper. It has holes on both sides to let the air circulate, keeping the garlic fresh. It is not, and I repeat, it is not a Mouse House. It may look like the perfect Mouse House but it is not a Mouse House. 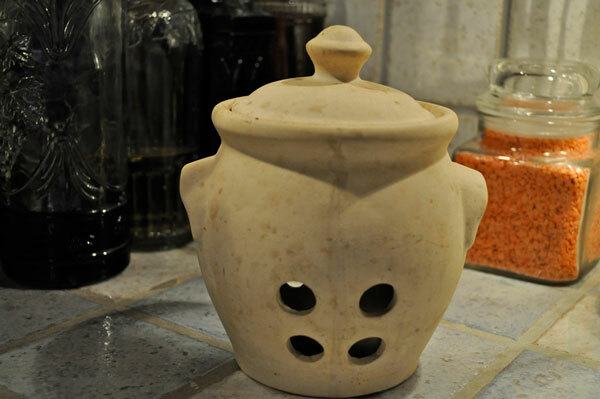 It is a Garlic Keeper where the human resident of the big house keeps her garlic…. We have been invaded by more mice than usual this fall. Apparently we’re not the only ones. During class the other day everyone of us living in the middle of nowhere agreed that there were many, many more mice this year. And they are arrogant mice. I was sitting at my desk the other day. One came out from under the fridge, looked at me, said ‘Bonjour’ (It’s a French mouse) and went on about his business without so much as a second glance. He looked rather disgruntled and meandered back under the fridge. I suggested to mon mari that he might want to set a trap. He did, baiting it with peanut butter as that seems to be the preferred treat. An hour or so later, mon mari went into the kitchen for a wee snack – with peanut butter. A few minutes later I watched the mouse bypass the trap with the peanut butter and run up on the counter to lick the peanut butter off of the knife. Later that evening I was making dinner…. As I so often do. I went to the garlic keeper, where I keep my garlic and where I have been keeping my garlic for the better part of 25 years. I lifted the lid and there, sitting on my garlic, was a mouse. He looked almost as startled to see me as I’m sure I looked at seeing him. I may have uttered a quiet shriek….. Since he was contained, well, except for the holes, I decided that it was a good time to relocate him. I didn’t really want him nibbling my fingers as I escorted him from the premises so I grabbed my oven mits. I picked jar up, covering the holes and we went for a nice walk in the country. When I judged us a suitable distance from the house (I’m sure I was wrong) I moved one hand and he leapt out of a hole and ran into the weeds. I’m sure he’ll be back. Good for you to set him free, even though he startled you. Kind heart! I don’t have the heart to kill them, but after 10 years of living in my house, I had three move in and the thought crossed my mind. I set humane traps, caught them. walked them out, WAY out into the nature preserve and within two days, they were back. I’m positive it was the same ones because the second time I caught them, I took them roughly two miles from the house and let them go in the same nature preserve. This time, they did not return. But it took me a week or two to get rid of them. I hope no mice gain access to our French abode -here it is rats we have to deal with and I have no qualms about dispensing bait which won’t affect any of the natural predators! I discovered celeriac in France. I agree it is a wonderful vegetable which both of us enjoy. Wrapped in plastic wrap, it lasts well in the fridge but I usually plan to use it up in various ways over a few days. Being there in the summer months it has to fit in with summer style eating. Zoomie, I’m happy to have them dead but I can’t kill them LOL I’d be very happy if they just stayed outside. nightsmusic. if they would clean up the dog hair on the floor I’d feed them! I’m waiting for this one to come back. I didn’t take him far enough. Gill, I worry about the bait. It’s not clear on the pkg how it works. Celeriac, like cabbage, requires planning to use it all – but we love it. Katie I am chuckling at your mouse story. It reminds me of a rodent situation I had many years ago. I was living in a small rustic cabin at the time. There was a lazy susan cupboard in the kitchen where I kept potatoes as it was a dark and cool place. Each night for a good week I swore I could hear strange noises coming from the lazy susan…only to look and find nothing. One night I got up about 2 am, there were strange noises once again coming from the lazy susan. I quietly walked into the kitchen, and opened the cupboard door. There standing on it’s haunches was a 6-7 inch long rat munching on a potato. I screamed so loud, the rat dropped the potato & ran for it’s dear life out some crack in the side of the wall to the outside. Never to be seen again! I can not kill them either…thankfully I did not have too! Of course your dogs are lovely. But. Clearly a cat is in order here. We have a delightful (cough… errmmmm) furry black fiend who would love to practice his French and would quickly make very short work of any mice who had the audacity to move into any part of the house. Ina, that’s hilarious! I’m sure I would scream, too…. Not that I’m afraid, but it’s so startling! Elizabeth, we would be eternally grateful if your cat could come and take care of our mice problems…. accompanied by appropriate guardians, of course.